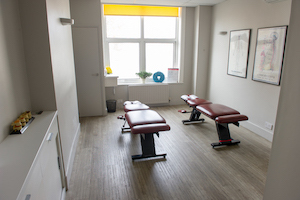 At the beginning of your Second Visit, the chiropractor will present the First Visit examination findings, his/her diagnosis and, if chiropractic treatment is suitable for your case, a treatment program tailored to your needs and goals. He/she will then answer any questions you might have, so you will fully understand your condition and how chiropractic treatment can help. The Report of Findings is free of charge and usually lasts 15-20 minutes. At this point, if you decide to commence treatment, there will be enough time allocated for you to also receive you first adjustments. If this is the case, you will be charged at the usual rate. Our friendly reception staff will then advise you about payment methods and the available plans that best suit the length of treatment required by your case. They will also assist you in booking your follow-up Regular Visits. Your Regular Visits at Chiropractic First will normally last between 10-15 minutes. At the end of you Second Visit, you will also be given a password to access the Patient Zone section of our website, where you will be able to learn more about Chiropractic and which will also give you access to valuable advice and exercises to complement your treatment.